The Diamond MMA compression jock and cup system is the ultimate in groin protection for high-impact sports and delivers the most effective groin protection without sacrificing comfort. Made from military grade elastics and premium spandex, the Diamond MMA Compression Jock leverages a high performance 4-strap jock system to hold a specially designed athletic cup in place within a perfectly tailored cup pocket. This patent pending system prevents both lateral and vertical movement of the cup. 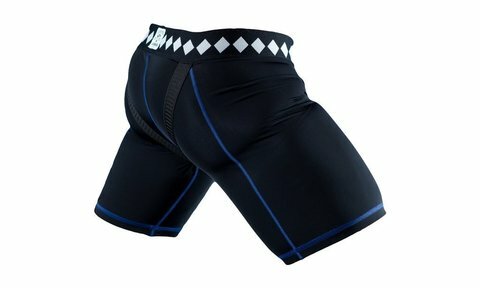 The Diamond MMA Compression shorts have a drawstring providing a custom fit. The Diamond MMA Athletic Cup incorporates a co-molded elastomer design coupled with a polycarbonate core to provide uncompromising comfort and protection for the athlete. The cup's patent pending design protects sensitive groin muscles and nerves with a specially designed ergonomic soft elastomer edge. The core of the cup is made with a rigid but flexible polycarbonate, the same plastic material utilized in bulletproof glass. Designed by award winning designers and Stanford University engineers, the system has been approved by Doctors and Urologists as the best groin protection on the market.